Booker T Thinks AEW Shouldn't Compete With WWE, Says Hogan Has "Paid For His Mistakes"
Former World Champion believes Hogan is "back home" in WWE. Booker T believes AEW shouldn't think about competing with WWE and instead should focus on producing a decent alternative TV show, according to a recent interview with WhatCulture. The most decorated wrestler in WCW history also thinks that controversial wrestling legend Hulk Hogan has "paid for his mistakes" and that Hogan is now "back home" in WWE. "It's huge for the wrestling business...I think they shouldn't think about competing [with WWE], I think that's the biggest mistake one can make when getting into business is trying to compete. WCW would still be here if they'd have just stayed in their own lane and did what we did best, wrestle...I think every time someone tries to get in and compete, they lose focus on what they really need to be doing and that's just produce a good television show, alternative television, something different to watch." He insisted that AEW needed to be different from WWE and that's how they would win, cautioning that when any company tries to be like another, they're doomed from the beginning. In terms of acquiring talent, the former world champion believes that if they were smart they'd acquire from the independent scene rather than attempting to sign members of the current WWE roster, as people want to see new faces and AEW need to create their own stars. Discussing the Kenny Omega situation, Booker stated that Omega could "do whatever he wanted to...stay on the independent scene and makes millions of dollars...he could go to AEW, he could go to WWE...the guy is really that good." Finally, when asked his opinion of Hulk Hogan's return to WWE, Booker was of the opinion that "...he's back home. Everybody makes mistakes, he's paid for his mistakes, hopefully he's atoned for them and we move forward." 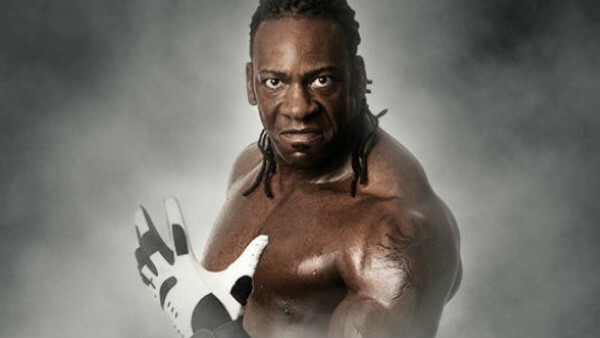 Declaring that Martin Luther King, Jr. would be turning in his grave if we continue to move backwards, Booker T wants everyone to let the past be the past, move forward, and allow Hogan to take his rightful place back in the WWE.